Successfully Added Professional Grade Digital Camcorder - Optical + Digital Zoom to your Shopping Cart. Wholesale priced Professional Grade Digital Camcorder with x3 optical and x8 digital zoom to get real close to the action. 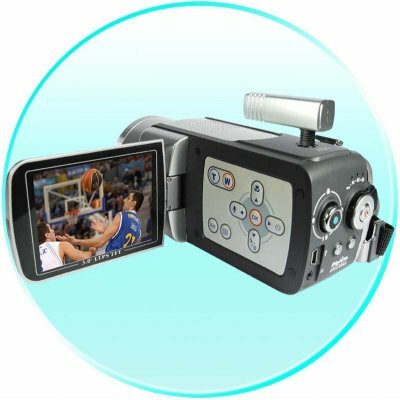 This high end Camcorder also features a detachable directional microphone for excellent sound pickup, interpolated 12 Mega Pixel still photos, LINE OUT for connecting with a TV, a remote control, rechagable li-ion battery, and so much more. If you want to capture all those special moments in your life with the highest quality, this is one Digital Camcorder that will definitely do it for you. Note on Interpolation: Please note that this camera takes images in sizes equivalent to 12.0 megapixels. This is through a software resizing process on the camera called interpolation. The image sensor of this camera has a native resolution of 5.0. megapixels. TV Out to connect with TVs ect.